In OK, Allan Metcalf tells the story of the most famous and widely used abbreviation in the English language. The cover calls it an “improbable story” and there are enough improbables in the tale to satisfy any reader. As Allan Metcalf has written elsewhere, “It’s improbable that a casual attempt at humor with a deliberately misspelled abbreviation in 1839 should have been drafted for the presidential election of 1840 (“Old Kinderhook”, Martin Van Buren) and then be the subject of a hoax (that Andrew Jackson couldn’t spell so he marked “OK” for “all correct” on documents) that led to people actually marking OK on documents and in telegraphy.” And, even more improbably, to its now being understood all over the world, even where English isn’t spoken, and that, Allan Metcalf points out, it can lay claim to its having been the first word spoken on the Moon. Many writers on etymology have summarised the story of this curious term. My own is here and so obviates the need to repeat its history in more detail. Its origin has been known since the 1960s, when the American lexicographer Allen Walker Read found clues through a careful reading of Boston newspapers of the late 1830s. Despite this, many folk-etymological tales are told about its origin — that it’s from Greek, or Choctaw, or French, or Scots, or that’s it’s short for the German Oberst Kommandant, or from the initials of Orrin Kendall biscuits or of the freight agent Obadiah Kelly. These result from its true history having been lost for more than a century. Metcalf’s book is the most complete of the various explanations that have appeared, the first ever in book form, more detailed in some respects even than Read’s original papers. Within its pages you will find, for example, the highly improbable ABRS, the Anti-Bell-Ringing Society of Boston; a news story about it in the Boston Morning Post on 23 March 1839 included the first-ever use of OK as a joking abbreviation of “all correct”. Metcalf takes the story on, chapter by chapter, through the 1840 election, the calumnies about Andrew Jackson’s supposedly being unable to spell, the various untruths about its provenance and its acceptance by railway telegraphers who leapt on it as a usefully brief way to signal the safe arrival of trains. He charts its move into the literary world (improbably, the first author to use it was Henry David Thoreau in Walden in 1854), its extension into slangy humorous forms such as okey-dokey, and its modern adoption in computers, in which OK is a ubiquitous caption for any button requesting acceptance. 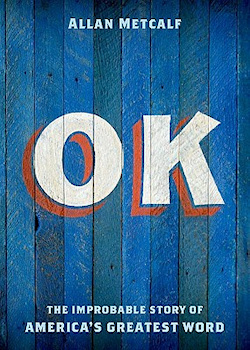 OK is indeed the most improbable of expressions, created as a lame joke and surviving by a series of unlikely coincidences to become a worldwide symbol of American English.